The popular indoor market, which earlier this year won the national title ‘Britain’s Favourite Market 2018’, is competing in the Best Food Hall category of the Farm Shop & Deli 2019 Awards. The annual awards are highly respected in the industry and play an important role in supporting and celebrating the UK’s independent, specialist retail market. Each entrant will be judged on many factors covering speciality retail, including the highest levels of service, product knowledge, initiative, innovation and community involvement. The judging process will include mystery visits and public votes from consumers via the awards website. Shrewsbury Market Hall is home to a large number of specialist food and drink retailers, artisan producers and popular street food venues. Three of its greengrocers are Shropshire farmers and smallholders who grow the majority of the produce they sell in the market. Its traditional butchers source from local farms and suppliers, including special breeds. The market’s delicatessen stocks local and regional artisan cheeses and charcuterie. All its bacon and sausages are home-produced from locally sourced pigs including the owner’s own herd. High quality speciality food retailers in the market also include a skilled artisan fishmonger, a spice blend and marinade specialist, a popular wholefoods store selling locally produced organic cereals, flour and oils and a national award-winning chocolatier who uses pure single origin chocolate for her creations. 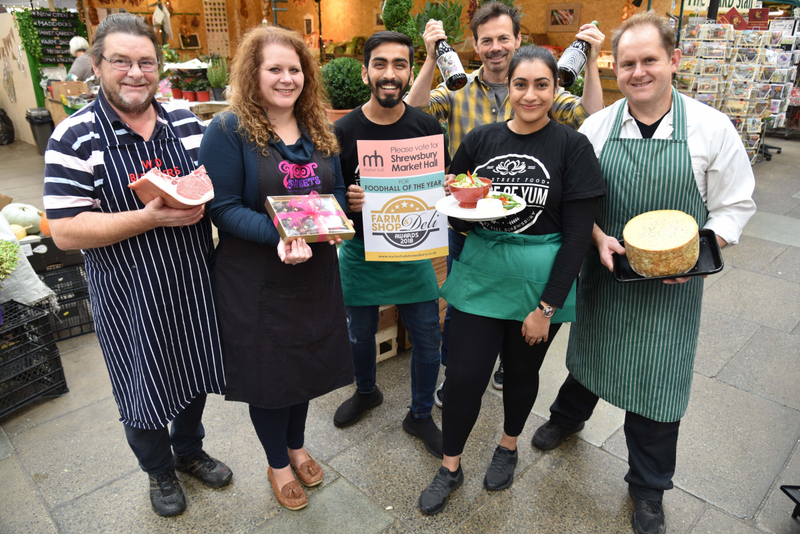 “When we won Britain’s Favourite Market the judges highlighted the important role that our incredible food and drink offering has played in helping to rejuvenate the market. Food and drink broadcaster Nigel Barden, chair of the judging panel, said the awards were a fabulous way to recognise and reward excellence for the UK’s local, artisan and high street speciality retailers. Vote for Shrewsbury Market Hall online at https://www.farmshopanddelishow.co.uk/awards-directory-2019#/shrewsbury-market-hall/awards-6450643. Voting closes on 31 October 2018 with all voters entered into a draw with the chance to win a food hamper.